Unless you have been there, it is almost impossible to imagine a place like Casa Blanca. The area surrounding Casa Blanca is wild, virtually uninhabited and extraordinarily beautiful. There are miles of shallow bays, secluded mangrove-rimmed lagoons, white sand beaches, and dense costal jungles. Once you have been to Casa Blanca and explored its vast tropical landscape and experienced its exquisite isolation, you will find that it will remain with you long after you have boarded your plane and returned home to civilization. The waters of Ascension Bay offer the light-tackle saltwater fisherman one of the most diverse selections of game fish in the world. 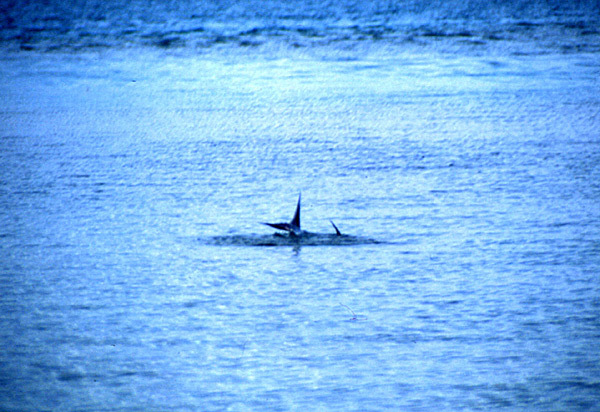 When conditions are right, an angler can cast to bonefish, tarpon, snook, permit, jacks, barracuda, cubera and mutton snapper, sharks, and several different reef species in a single week of fishing. This kind of angling diversity can be found in only a few spots in the world. It has been said that Ascension Bay has the world’s largest population of permit. As many as twenty have been boated in a single week (on the fly!). It is not extraordinary to see 25-50 permit within casting range in a single day. The "bones" at Casa Blanca are plentiful. They come across the flats in droves. They break off in singles or they tail in pairs among the mangrove shoots. Sometimes it seems that an acre of water begins to quiver, rise up and move in your direction. 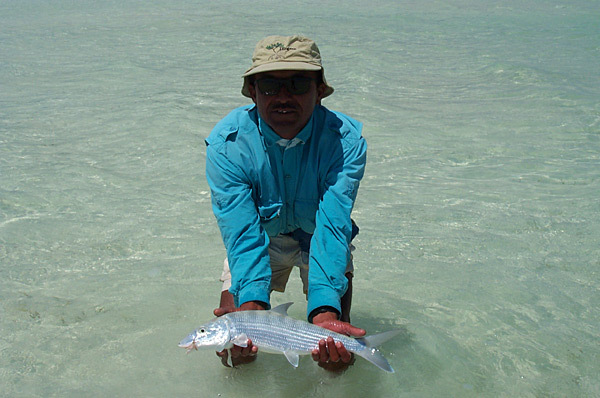 The bonefishing at Casa Blanca is suitable to any level of skill. The beginning saltwater angler will do well fishing among the schools of bones which run 2-4 lbs. More experienced fishermen can try for some of the bay’s larger singles which run up to 8 lbs. 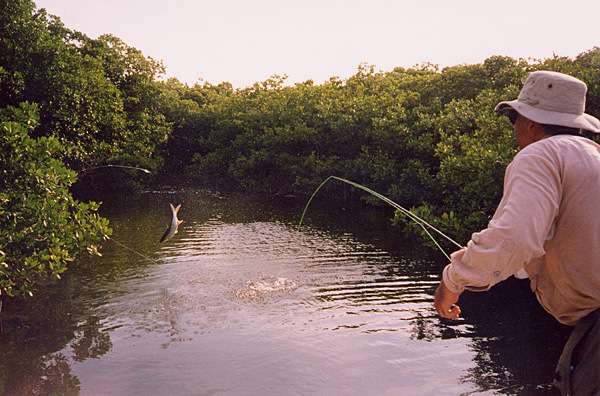 Tarpon are the largest, strongest, and most acrobatic of all the flats fish. 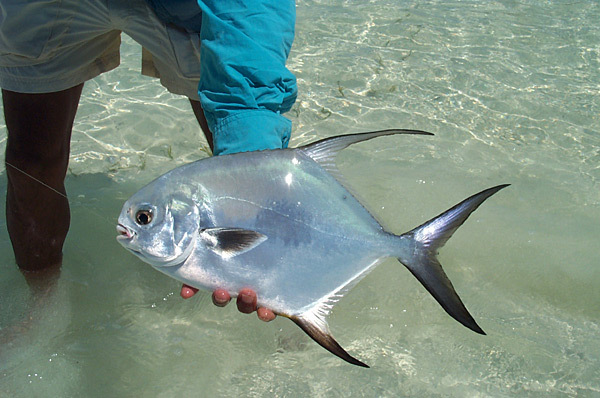 Casa Blanca is primarily known for its small to mid-sized fish (20-60 lbs.). And while there are plenty of tarpon to cast to in order to complete a Grand Slam, you should not consider Casa Blanca primarily a tarpon destination. A majority of these fish are natives which remain in the area throughout the year. Migratory fish begin to show up in the beginning of April and from then on, numbers will increase significantly through July. The lodge itself sits on Punta Pajaros, on the northern tip of Isla Casa Blanca, a small coastal island in the western Caribbean. Here, at the mouth of Ascension Bay, where the reef that divides the sea from the bay begins to bend inshore, you will find the lodge. Casa Blanca’s white buildings are clustered amid majestic palms that spring from a beautiful white sand beach. It is as remote and pristine a location as you will find in this hemisphere. Yet to get to Casa Blanca, it is only a short flight to Cancun and a forty-five minute charter flight down the Yucatan Coast. Then, just make a run across an inlet, slide through the narrow mangrove channel that leads to the bay and you will find yourself as close to “the way it was” as you will ever be. The accommodations are very comfortable. The Caribbean is only 100 feet away and a room with a view is the only kind available. The rooms are large and well-appointed with tile floors, mahogany shutters and very spacious baths. In the main lodge, you will find a well stocked bar with a very friendly bartender. After a full day on the water, it is a perfect place to relax and talk about the ones that did not get away. As you might expect in the Caribbean, the house specialty is fresh seafood including lobster, snapper and conch. You will always find the day’s catch simply and skillfully prepared. Casa Blanca is truly unforgettable. . . one of those rare places you will want to return to again and again.